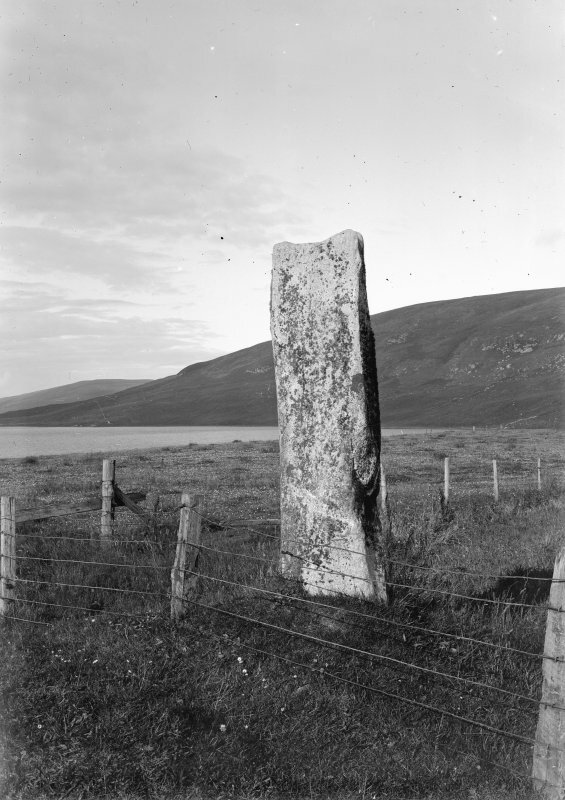 View of standing stone, Loch of Tingwall. A standing stone set with its major axis approximately NNE - SSW. It rises to a height of 6' 9" above the ground, where there is some evidence of packing and at 3' high it has a girth of 7'. Visited OS (RL) 7th May 1968. This 2m tall stone is located close to the neck of land that separates the two lochs which almost fill the floor of the valley, the Loch of Tingwall to the north and the Loch of Asta to the south. Information from ‘Exploring Scotland’s Heritage: Shetland’, (1997).